I am about to share some very unusual information from a conversation I have recently had with the "Dollar Store Diva." Who is this you ask? This is a name that was affectionately given to a lady by a group of AOL Bloggers. She is my life partner and the love of my life and my wife in marriage for 34 years, Marlene Alexander. But why would I interview my own wife? Only because of what I have been learning from her about huge traffic spikes that she's been getting lately. I've been watching her Web site grow in traffic, from literally zero to 1000 visitors per hour, but let me back up a minute. But one of her hobbies and talents is design and budget decorating, but with an rather unusual twist. She creates surprisingly attractive and original home decor creations using very simple elements anyone can find at the any local dollar store. Marlene is also a copywriter who researches and writes on a wide variety of topics from budget decorating to dental braces. You name it and she researches and creates original fresh content for businesses. She has been published in Reader’s Digest, other magazines and newspapers. Her story, “The Cloe Cure,” appears in Chicken Soup For The Cat Lover’s Soul. Okay, so back to the reason for the interview. Ask yourself how you'd like to wake up some morning and find your e-mail loaded with a ton of alert messages like this? 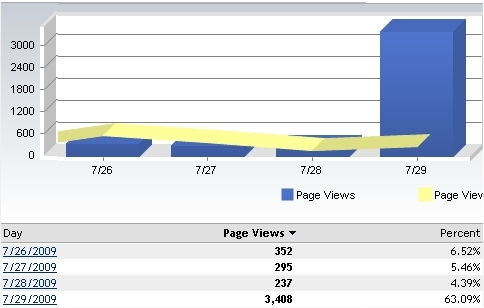 Your site, has received 1000 page view(s) so far this HOUR. Now keep in mind while Marlene has an eye for design and has a gift for wonderful creativity, she is not a Web designer or graphic artist. But I encouraged her that she should create a little Web site where she can share her budget decorating tips and ideas with the world. I guess like some of us, in the beginning she had no interest of building a Web site. It was around the time that Robin Nobles had seen some of her work and began to encourage her to start her own Web site that she actually began. It does not seem like that long ago (about 3 years I suppose,) but I have watched in amazement most lately as her Web site one night began to get huge traffic spikes around 8:45PM on a Sunday evening no less. It turns out that she was getting as many as 1000 visitors per hour to her Web site not just for 1 hour but every hour all night long until things started quieting down at 2AM in the morning! A few weeks ago, her Web site had very little return traffic. But recently she has had near 20% of her traffic returning between 2 and 5 times. The average time spent on the site might range between 2 and 3 minutes or less. But lately she had 18% of her visitors looking through her decorating tips for as long as 2 hours on average. I use to be impressed at getting someone to stay on a page for over 15 minutes, or maybe on the entire site for 30 minutes. By the time you finish reading this interview, you'll discover what had occurred. Remember that Marlene has never come to study SEO or take a course and I never took time to labor on her site for SEO purposes on her behalf. I encouraged her to write and share her ideas. I encouraged her to get involved Blogging someday. But the main reason I am sharing this interview with you is to encourage those of you who don't think you can experience success on the Web. Or perhaps you are putting off getting started for what ever the reason. I hope this interview encourages you to make a start and take a step to move forward. Okay, let's move on with the interview with Marlene. Hi Marlene, the reason I am interviewing you is to ask if you would share your opinions and thoughts about how you have progressed on your journey to the recent experiences you've achieved with your Web site. Some questions that I ask may sound strange coming from me, but I want to put down your exact words and thoughts about the experience to try and capture how it feels from your perspective. When you first started writing for the web, you chose to write about "decorating tips. Why was that?" About five years ago, I became interested in interior decorating and subscribed to a couple of decorating magazines. This was about the time I discovered dollar stores and realized that they had a lot of great stuff to offer, things like vases, candles, even small art work. I began to believe that many of the smaller projects in the magazines I was reading could be duplicated for much less money, if I used things from the dollar store, so I started experimenting along those lines. Eventually, I had several articles written and it seemed a natural progression to start a web site. I believe that all creativity, every gift we have, is from God. Can you talk about some of the components that are important considerations for developing "quality content" from your own experience? You probably know more about that than I do! But I would say that quality content is easy to read, i.e. proper grammar and spelling and flows naturally from one point to the next. First you do this, then this and so on. I always try to write in my own voice, conversationally, and not try to sound like something I'm not or be too formal. I think you should try to write like you were talking to a good friend face to face. Sometimes when people start out their writing career they can become discouraged. They may not believe in their own work enough to follow through. Do you have advice on how to proceed when you become discouraged? That's a tough one. I've been there and it can be hard to get around, but having people around you that believe in what you are trying to do is a great help. There were times, when I was discouraged, when I would give up but, after a time I started to feel that I could and should try again. So I would say, gather people around you who are encouraging and helpful and, if you need to take a break, take it. After a while, you start to see things in a different light and get re-energized. When you approached AOL to begin blogging, did you write for other Web sites or did you just start building a brand new site on your own? Actually AOL approached me. I was already writing regular columns about dollar stores for two online magazines and was building the content on my website when an editor from one of AOL's blogs approached me to blog for them. Did you ever expect to see the type of interest that you have seen in your creative Web content on budget decorating? No! I had hoped to help a few people to see that they didn't need a huge budget in order to make their homes more comfortable, but I had no idea that so many people would see the blog and become interested. I think the reason people are taking a closer look at dollar stores is the slow economy we're currently experiencing. So one of the reasons you've experienced these enormous traffic spikes is the fact that you are Blogging too. On the evening of Sunday just past you literally had floods of traffic come to your Web site of up to 1000 visitors per hour. It was not just for 1 or 2 hours but every hour all night long into the early morning. How many people out of those several thousand visitors took time to write or leave a comment? I think it was something like 111 comments by Monday morning. As a writer, what advice do you have for other writers who might just be starting to make a transition to the Web from the traditional methods of writing? I would simply say: Write about what you love and put your focus on helping others. And remember that success doesn't usually happen overnight (my website is three years old) but, with patience and adding quality content on a regular basis, the rewards will come to you. How do you come up with so many new decorating ideas with just common everyday materials. Any tips? With practice, you start to see ideas everywhere, not just in the decorating magazines. One thing I tell people is to take notice of store displays. Any small project that peaks your interest could probably be duplicated with dollar store finds. That being said, you shouldn't expect your finished project to look exactly the same as those you see in stores and/or magazines. Do you have any tips you could share with our readers about how to build a Web site that might produce the type of results that you have had traffic wise? Obviously, it's not about how fancy you make your web site look. As you teach people continually, it's about quality content which means articles of 350-400 words that help or inform people in some way. Just keep adding good-quality informational articles. Google will find you. How does it feel to go from just a few visitors per day to over 1000 visitors per hour, for several hours in a row? Do you think you still have enough creative thinking to continue coming up with useful ideas to help people save money and still decorate in style for a reasonable cost? As long as you're passionate about something, ideas will always present themselves. Home decor, like so many other things in life, is an area of infinite possibilities. There are so many different styles from Victorian to Country to Modern and people mix and match styles. Infinite possibilities. Is publication of your money saving decorating tips the top or do you think you'll be expanding and growing even further in the future. Well, one thing usually leads to another and just now, people are very interested in saving money in every area of their lives. I'm working on finishing a book of my favorite decorating projects from Dollar Store Style and I'd like to see that published. Oh, everyone has that potential! I have been very impressed watching your work and seeing you grow as a writer. This is just a personal comment so that readers know that I have not coached or counseled you in any of your creative Web development. I have just been quietly watching and of recent, I must say how proud I am very proud of your progress. Thank you, Dear. You did help me to get set up on the web and your and Robin's encouragement has been a big help. Thank you for making your thoughts and opinions available to the readers. I hope it encourages many. Perhaps someday I'll call upon you to come teach your writing secrets at an upcoming live Workshop. That would be fun! Especially if you pay me! I understand you have a budget decorating newsletter coming out soon? Where can readers learn about it? Simply go to the website: www.dollarstorestyle.com. You'll see an area near the top of the homepage where you can sign up for the decorating tips newsletter. Thank you my dear. I can't tell you how encouraging it has been for me to interview you and I hope to share other cool observations from time to time if you don't mind. Thank-you! It's been my privilege. If you are putting off getting started writing on the Web (for what ever the reason,) I hope this article encourages you to make a start and take a step. There is nothing holding you back but the fear of the unknown or for some of us it might be a fear of failure. If you enjoy writing part time or full time whether you are just beginning or trying to get started - take a step in the right direction. This truly is the year of the writer for the Web. There is a big demand for high quality content that is well written. Please be encouraged and take a step towards building towards your dreams. The truth really is that, if you can dream it - you really can do it! Marlene Alexander is a copywriter who researches and writes on a wide variety of topics from budget decorating to braces. She has been published in Reader’s Digest, other magazines and newspapers. Her story, “The Cloe Cure,” appears in Chicken Soup For The Cat Lover’s Soul. If you don't have the book you read it on Squidoo. Marlene also writes for one of AOLs Money and Finance Blogs called WalletPop. Visit Dollar Store Style for ideas on budget decor.